Las Vegas is many things. 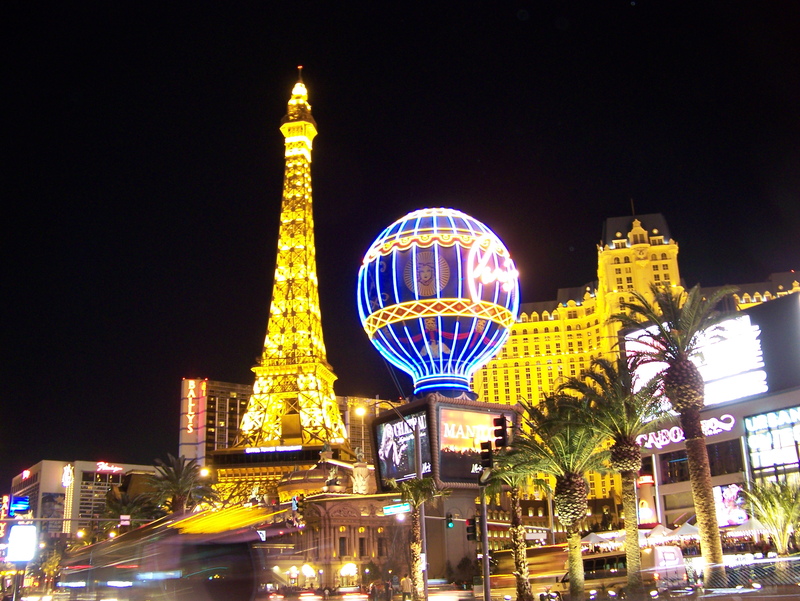 Known as Sin City, Las Vegas attracts all kinds of people to fit its many dimensions. Spring breaks were approaching. It was the weekend of the Nascar race. There were gamblers, smokers and drinkers everywhere, with advertisements for prostitutes and lawyers to solve all the legal troubles you accrued while in town on every corner. Las Vegas is ostentatious, shiny, full of pollution (we could see the haze from the city all the way in Valley of Fire State Park, and Jon said he could see it from Death Valley National Park, four hours away in California. ), shocking, mesmerizing and awe-inspiring. If you hadn’t been able to tell from my description, its charms didn’t woo me, and they definitely didn’t woo Jon. He said he wouldn’t mind if a volcano erupted and buried Vegas for a couple hundred of years. Mostly, though, I (and Jon, too) am speaking of the Strip. We spent time off-Strip eating and playing. Those are the things that did woo Jon and me (Neon Boneyard, Hoover Dam, Valley of Fire State Park, Red Rock Canyon National Conservation Area, all of which will soon be highlighted here). We discovered that away from the Strip, Las Vegas is like most other cities with suburbs, if you exclude all the advertisements for slot machines. There were expensive houses in gated communities and strip malls and shopping centers and lots of luxury cars west of the Strip. East of the Strip were the older parts of town, some more run down than others. But the Strip is where all the action is. 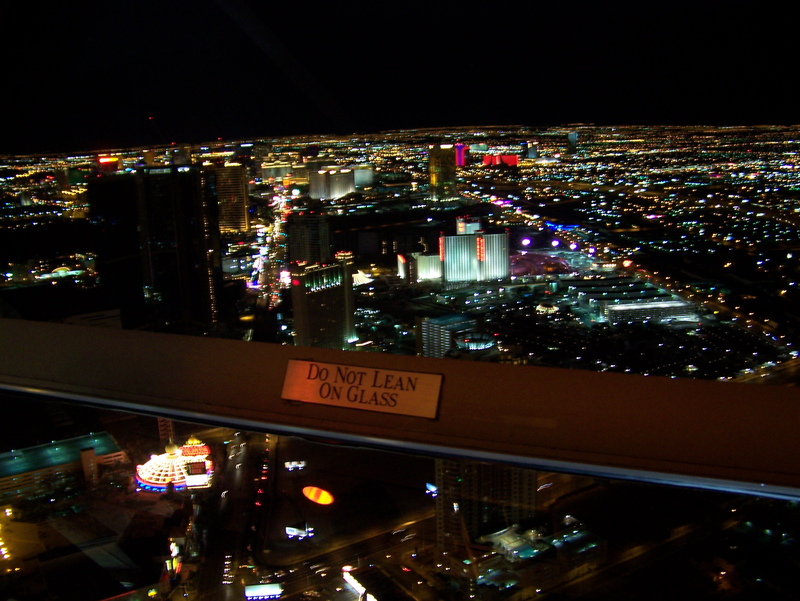 Flying into McCarran International Airport provided wonderful, aerial views of the Strip with all of the millions of lights sparkling far away into the desert. Jon met me at the airport, and we headed to our downtown hotel on Interstate 15, which runs parallel to the Strip on its western side. Even from the highway, the establishments on the Strip were impressive. The lights. The heights. The colors. The idea that someone thought we need all this. The Strip looked exactly like the pictures. 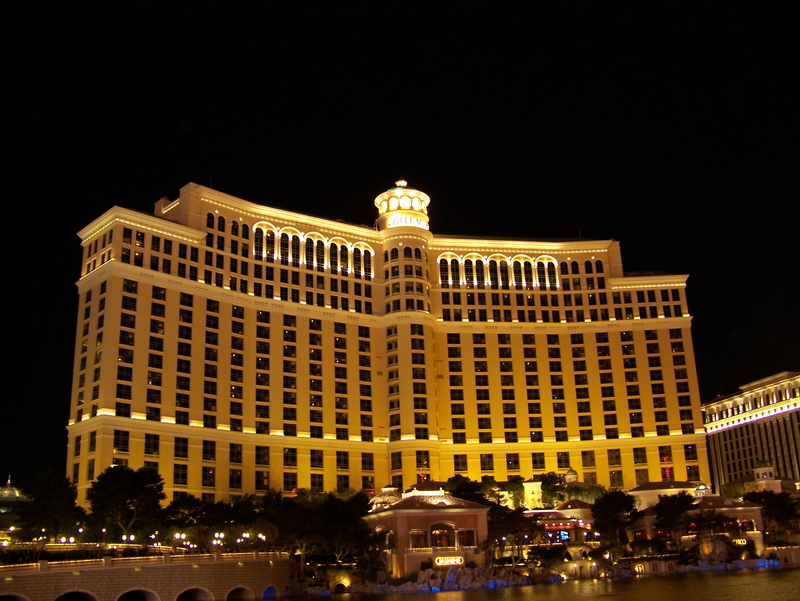 At night, it was beautiful to look at, especially the Bellagio Fountains. But underneath the lights, there were so many shocking moments in Las Vegas. I hadn’t been in a casino before, and after talking about my experiences with a few people, it seems as if the casinos only get worse from here. It was hard to breathe because of the amount of smoke. But what was the most shocking were the people entranced by the slot machines, pressing button after button for hours on end. I know how easy it is to spend money on them, too. I had a credit from one of the hotels we stayed at for some slot play, and Jon managed to spend $20 in about 1 minute without trying. On the other hand, though, for 1 cent bets, you could play forever. I definitely wasn’t hooked, especially since I could hardly figure out how to work the computerized slot machines. I much would have preferred cards, where there are rules and logic, but I can’t imagine that I’ll head to another casino some day just to try my luck at a hand. In addition to being shocked at the casinos, we were shocked that people actually take their children to the Strip. I wouldn’t want to expose my children to the attitudes of the people who do frequent the area, whether it’s for drinking or gambling. My biggest problem is that this is an area full of misbehavior. It’s an area where misbehavior is permissible, and that’s not a message I would want to send to a child. 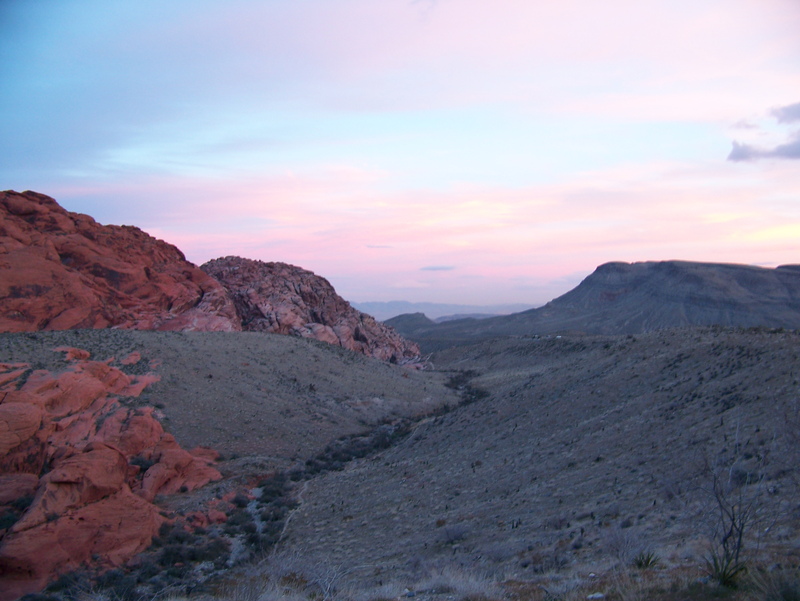 Without cheap flights and decently priced rooms (though my search for lodging is also worthy of its own post), Las Vegas would not have been so accessible for us. But once we arrived, finding inexpensive food was a huge problem. Fast food is off limits, and finding an inexpensive restaurant, even with the help of guidebooks and my Urban Spoon iPhone app, is challenging in Las Vegas. We ate at three restaurants during our time in Vegas, and only one had prices low enough for a meal under $10, which is always my goal. Non-chain, local places are usually the way to go, as are Mexican restaurants, and I could eat tacos multiple times a week. Jon and I first tried Los Tacos, at 1710 E. Charleston Blvd., a few miles east of the Strip. The tacos were huge and filling, and the chips and salsa were tasty. The restaurant was an order-at-the-counter type of place, and there were a handful of locals eating there, too, when we arrived late in the evening. A few days later we ate at Hash House A Go Go, which is where I had an epic burger and Jon had a crab cake hash, which surprisingly, didn’t have hash browns, but was served with cubed potatoes instead. Prices were higher but still affordable, and it was a good meal with lots of food. I would really like to go back for breakfast. On our final day we ate at El Sombrero, mentioned in a recent New York Times article about Las Vegas, written by Matt Gross. It was also above the $10-a-meal mark, but they served up some delicious Mexican just off the north end of the Strip. On weekdays, the restaurant isn’t open for dinner, so we just made it for a late lunch. This was a much cozier location than Los Tacos, and the food was much more of the Mexican style I imagined. The menu was full of combination plates and we were served complimentary chips and two types of salsa. Everything was delicious, and we left quite happy and stuffed. You are probably wondering why I even wanted to go to Las Vegas. Simply, it’s a place I wanted to see, especially at night. It just really wasn’t my style and there isn’t anything on the Strip to occupy my interest for a return trip, because Jon and I visited all the hotels I did want to see. But I expect I will be back, in the sense that I am sure I will pass through. It is perfectly located within a half-day’s drive from all sorts of natural wonders like the Grand Canyon in Arizona and Zion National Park in Utah. 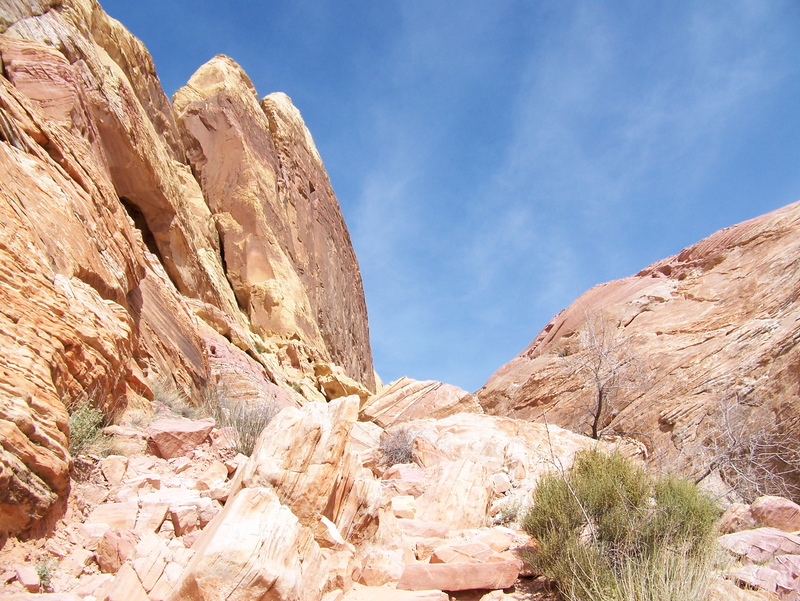 We had toyed with going to Bryce Canyon National Park in Utah, about five hours from Vegas, and Death Valley National Park in California, but we decided there were enough appealing rocks much closer to Vegas, like the ones at Red Rocks. So really, there are two sides of Vegas. There’s the Strip and then there’s everything else. Some people go to Vegas and never leave Las Vegas Boulevard, but if you stay put, there are so many things you are missing. Go see the desert and the mountains and the rocks, where you can be awed by something natural, something that man didn’t build. Have you been to Las Vegas? How do you feel about the Strip and the surrounding area? Next up is the Neon Boneyard. 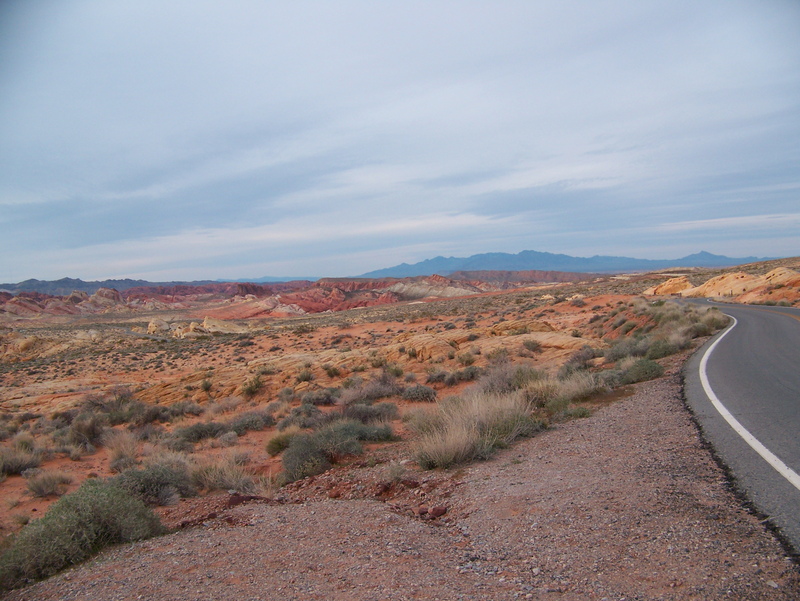 This entry was posted in North America, Photos, Planning a trip, Travel Narrative, U.S. and tagged Gambling, Hiking, Impressions, Las Vegas, Mountains, National Parks, Nevada, Photos, Planning a trip, Rock climbing, Rocks, Shock, State parks, Travel. Bookmark the permalink.